I’ve discovered another mysterious disappearance tied to the Cecil Hotel. This one somehow eluded all previous archival searches, and it’s quite an odd and interesting case. I call it The Case of the Missing Consul. 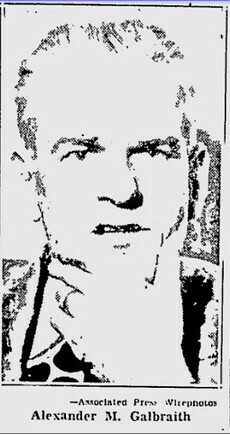 Around noon on December 31, 1947, Alexander M. Galbraith, 50, stepped out of the office where he had served for the past four years as the British Consul for Pittsburgh, Pennsylvania, and vanished. His daughter Jean, who was his secretary, said he’d been brooding about the possibility of losing his position to one of the career diplomats who’d been freed up by the end of the war. He was right to worry. That very morning, he’d been informed that his services were no longer needed. The reason given was that, though Scottish-born, he was a naturalized American. Galbraith, who’d been a WW1 flying ace and had a fiery reputation, was incensed. He was passionate about his position, giving pro-British speeches to local men’s clubs, dedicating long hours to aiding war brides whose American grooms had abandoned them. And now some bureaucrat was going to take his place? It was too much for him to stand. On New Years Day, Deputy Coroner Ken O’Toole said Galbraith had come in, asking about a pair of missing spectacles. But a search of the neighborhood came up empty. A Pullman porter saw a photograph of the missing man, and told police he was certain he’d served him on a train bound for Chicago. Chicago authorities were alerted, but Galbraith was nowhere to be found. Searches in Washington and Cleveland also turned up nothing. His wife and daughters were frantic. Weeks passed with no word. The shame of losing his job must have been too much. Had Galbraith killed himself? 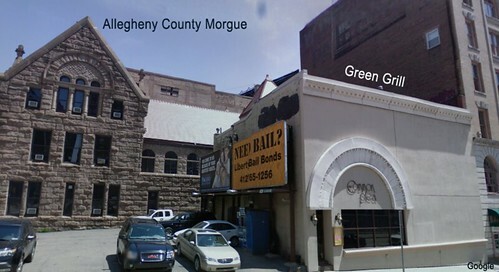 On January 27, 1948, Galbraith sent a telegram to George B. Stelluto, proprietor of The Green Grill near the Pittsburgh morgue, asking for a loan of $50. Stelluto, a friend, went to the police. Later, Galbraith told reporters in Los Angeles that he’d only wired Stelluto because he didn’t have any money for food. He needed a stake to get back on his feet. So what had happened to him? Galbraith was one of the lucky ones. Many other troubled souls had found a bed at the Cecil and lacked the courage to ask for help. He went home. Reporters, who always want more, asked after him. Jean said that he was somewhat unwell from his travels, and was resting. Jean protected her father well. We hear nothing more about him, and sometimes hearing nothing is the happiest ending of all. 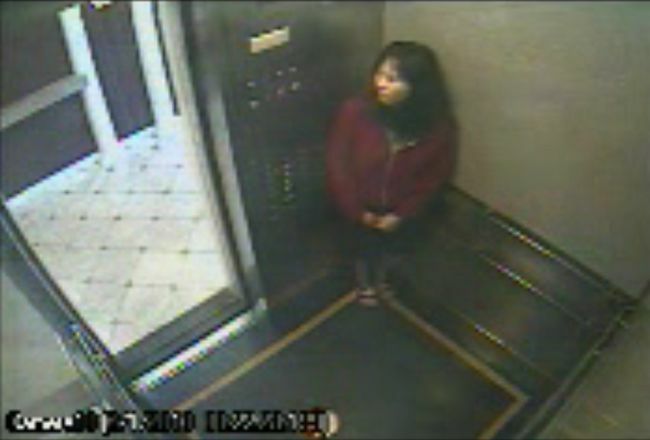 It was with shock and no small amount of horror that we learned that a body, believed to be that of Canadian tourist Elisa Lam, last seen behaving strangely in an elevator security video recorded on February 1, had been discovered today within one of the water tanks on the Cecil Hotel’s roof. A complaint about low water pressure had prompted an employee to look inside. Hotels by their nature are the backdrop for extreme behavior, and any public building that stands for the better part of a century will collect its share of tragedies. 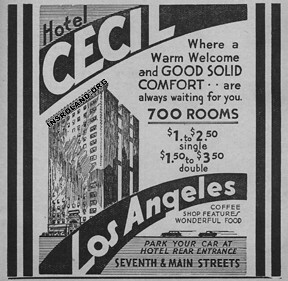 The Cecil (established 1927) is notable among true crime aficionados as the short-term residence of serial killers Jack Unterweger and Richard Ramirez, and in all the attention paid to those grim gentlemen, the hotel’s other heartbreaks too often go unmourned. The probable fate of Miss Lam inspires us to compose a memorial note, to the five prior ladies (and one unfortunate fellow) who left this world on the grounds of the Cecil Hotel, and whose wraiths may yet haunt the place. 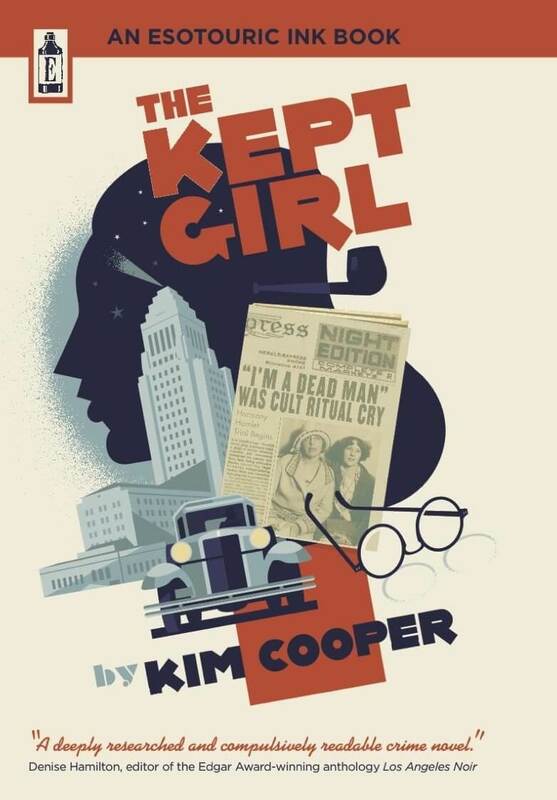 On June 4, 1964, “Pigeon Goldie” Osgood, retired telephone operator and well known protector and feeder of the birds in Pershing Square, was found dead in her room by a hotel worker distributing phone books. She had been stabbed, strangled and raped, and her room ransacked. 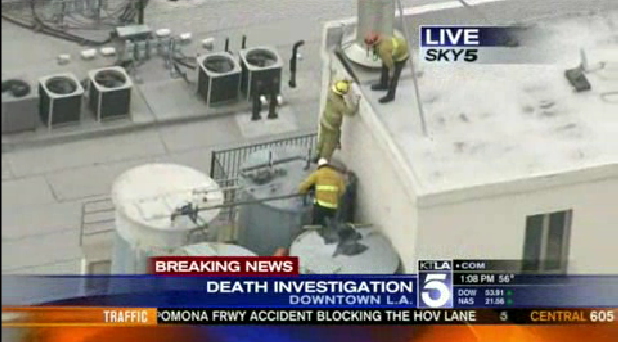 Near her body were found the Dodgers cap she always wore and a paper sack full of birdseed. Soon after, Jacques B. Ehlinger, 29, was seen walking through Pershing Square in bloodstained clothing. He was arrested, but cleared of the crime, for which no one was ever arrested. Pigeon Goldie, we remember you, too. It was October 12, 1962 and Pauline Otton, 27, had been arguing with her estranged husband Dewey in a room on the ninth floor when he decided he’d had enough and went out to get some dinner. She decided she’d had enough, too, and jumped from the window. She landed on top of a pedestrian, George Gianinni, 65, and both were killed instantly. Since no one saw Pauline jump, police initially thought they had a double suicide on their hands–but on closer examination, George had his hands in his pockets and was still wearing shoes, which would have been unlikely if he’d fallen ninety feet. Pauline, and George, we remember. On February 11, 1962, Julia Moore climbed out of her eighth floor room window and landed in a second story interior light well. She left no note, just a bus ticket from St. Louis, 59 cents in change, and an Illinois bank book showing a balance of $1800. On October 22, 1954, Helen Gurnee, 50-something, stepped from her seventh floor window and crashed to her death atop the hotel’s marquee. She had registered as Margaret Brown a week before. Helen—or Margaret, as she preferred—we remember. Elisa Lam, 21, left her home in Vancouver for a solo trip to California. Her plans after visiting Los Angeles were to continue north to Santa Cruz, but it seems that she never left Main Street. She had the great misfortune to vanish while the Los Angeles Police Department was absorbed with one of the largest manhunts in its history, and one cannot but wonder what impact the search for Christopher Dorner had upon the search for Elisa Lam. Perhaps she climbed up the side of the water tank, lifted the hatch, slipped inside, drowned, and then floated there for weeks until her body sank and blocked the pipes. Maybe someone who knew the nooks and crannies of this very old establishment put her there. In time, the answer will come, but it will make no great difference. She is gone, and she remains. Elisa, we remember. And hope the souls that went before can lend some comfort now to yours. See also The Case of the Missing Consul.